There are lots of different types of surfboards, but if you are a beginner to surfing, one of the best ways to learn the sport is by using a foam surfboard. Foam surfboards are also called soft top surfboards, for their cushioned design. But don’t mistake a foamie surfboard for being cheap or unreliable. In recent years, foam technology has advanced, and foam surfboards have come a long way for beginner and intermediate surfers. If you’re an expert, you’ll likely have invested or looked at purchasing your own fiberglass board, but a foam surfboard can be an affordable way to learn surfing and own a board. Foam surfboards are great for those learning because they are more forgiving than a hard surfboard, but there are still a lot of options available on the market and it can be frustrating trying to find the best one for you. 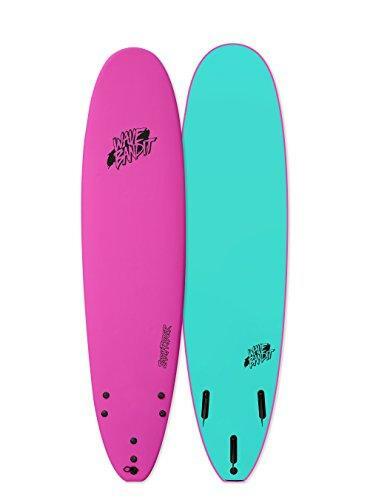 There are both long and shortboards available in a variety of styles. If you are brand new to surfing, you will want a larger and longer board for the stability. Besides being easier, foam surfboards a simply fun. Even an expert can have a great time catching some waves on a foam soft surfboard. With our list of the best foam surfboards, you’ll be off to catching waves in no time. 1. 7’ Soft Top Surfboard by South Bay Board Co.
4. 8’8” Premium Beginner Foam Surfboard by South Bay Board Co.
7’ Soft Top Surfboard by South Bay Board Co. This Soft Top Surfboard is 7 feet long and 22 inches wide. It has an EPS closed cell foam core and a fingerprint textured IXPE foam board top deck and a diamond weave slick HDPE bottom deck. It has a rubber tail bumper for safety while storing it upright. All of South Bay Board Co.’s boards are custom molded. The board is lightweight and long-lasting. The texture of the foam ensures that it can be used wax free. It is still rigid enough thanks to the fiberglass rod center, which gives it durability. This surfboard is beginner friendly and has a rounded thruster nose. It will easily offer stability for those learning to get to their feet. It offers a fun performance and comes with everything you need. 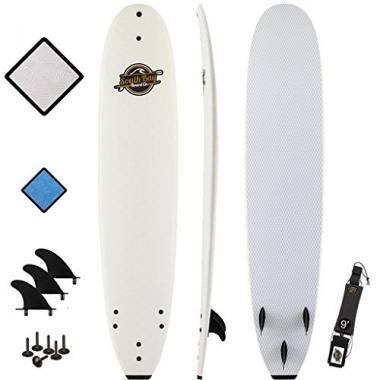 The board includes surfboard fin screws, a leash plug screw, surfboard fins, and a surfboard leash. South Bay Board Co. also includes their 100% Satisfaction Guarantee. This Albert Surfboard is a perfect starter board for kids and adults. It can easily support up to 175 pounds of weight. It has a core made of recycled EPS foam covered in a fiberglass cloth. The entire board is a soft top for enhanced durability and safety. It has a stylish twin fin design and is extremely buoyant. It is a shorter size but is wide enough to give even beginner the stability they need to stand on their feet in the waves. Foam surfboard reviews love this board and say it is “fun”, “won’t knock out your teeth” and a “great board!”. 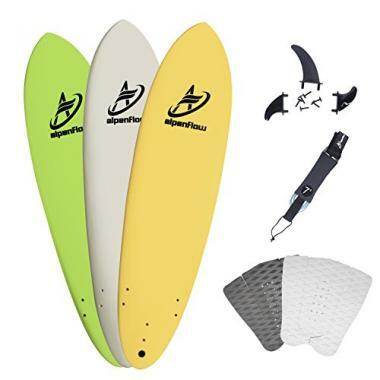 This Foamie Surf Board has a durable construction, is colorful, has removeable fins, and is convenient to use for all beginner surfers. 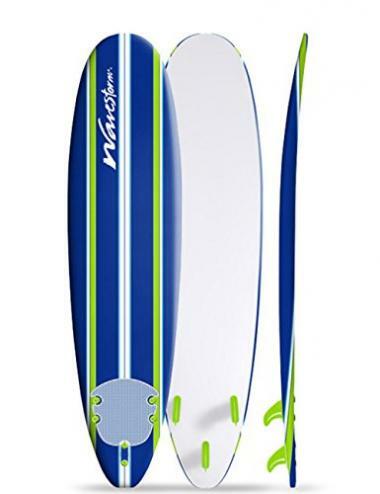 This surfboard has a durable top foam deck and a slick HDPE high speed bottom. It is strong and has the stiffness needed to maximize board speed. The foam top, EPE deck, EPS core, and PP hard slick bottom make this foamie surfboard durable. It comes with a free leash and traction pad, which blend perfectly with the bright color scheme. The traction pad makes the board comfortable and convenient to use. It has a removeable fin design for easier transportation. The board is ideal for adults and children who are beginning to surf. It has a weight capacity limit of 200 pounds. Simply assembly is required, but Giantex ensures they have clear instructions provided with your purchase. 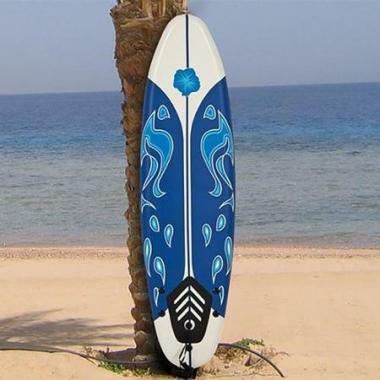 Giantex also ensures their surfboard are fashionable with a good quality and competitive price. 8’8” Premium Beginner Foam Surfboard by South Bay Board Co. 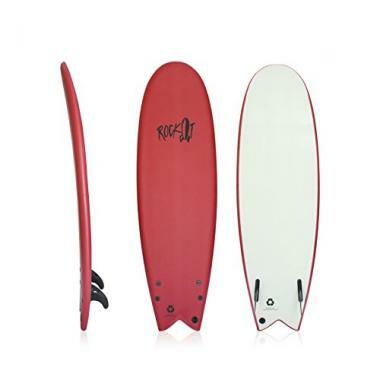 This Premium Beginner Foam Surfboard has a great design that easily supports beginner riders. It has a weight capacity limit of 230 pounds, so it can be used for children and adults. It has a fingerprint textured IXPE foam board top deck and a diamond weave slick HDPE bottom deck. An EPS closed cell foam core makes the board durable. All of South Bay Board Co.’s boards are custom molded to be long-lasting and lightweight. It is a wax free design that is extra rigid and beginner friendly. It has a rounded nose and a pulled in squash tail to make it even safer for beginner surfers. Included in the purchase are fins, fin screws, a leash plug screw, and a surfboard leash. South Bay Board Co. also includes their 100% Satisfaction Guarantee. 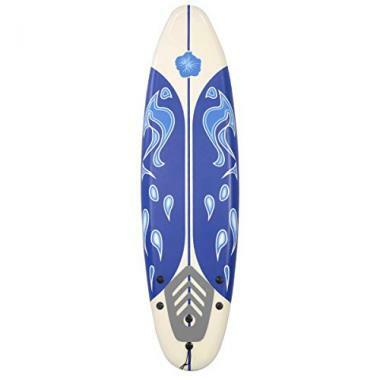 This EZ Rider 8’ surfboard is an egg shape, which is great for beginners and advanced surfers. It has an EPS core with double maple wood stringers. A tri-fin setup makes it easy to catch waves. It is kid friendly. With a great performance, you can shred the waves. Its name, “EZ Rider” is derived because it is such a great board for beginners to use to learn how to surf. It has a maximum performance and quality with an affordable price. It will require surf wax for extra grip. This Classic Pinline Surfboard is 7 feet long. It has a water barrier skin and a patented graphic film technology on the deck. The high-density HDPE slick bottom will give you speed. It has a strong EPS core and 3 marine ply stringers. There is a traction pad and bolt through components in the fin system. It is lightweight, soft, and easy to handle. Wavestorm ensures they bring you their most advanced and innovative material compositions available. A polyurethane leash is included. This Foamie Surfboard is very durable. It has a foam top and slick HDPE high speed bottom. It is great for beginner surfers of all ages. Both adults and children can easily use their board. It comes with a free leash, traction pad, and removeable fins. Best Choice Products ensure their designs can take a beating but are soft enough that they won’t bite back. Their boards are the best in class for performance and quality. The board looks good and feels great. This foam surf board is 7 feet long and can support riders up to 185 pounds. It is great for beginners. The surfboard is durably with double reinforced and treated polar stringers, a fiberglass top and bottom, and an HDPE reinforced plastic bottom. It has a high density but is lightweight. The pointed nose and pin tail design made it fast and unique in its performance. It is also scratch resistant, so even your fingernails won’t leave a mark. Included with the purchase are a surfboard leash, three fins, and a traction pad. When it comes to choosing a foam surfboard for beginners, you want the highest quality. The best foam surfboard won’t break on the first use or fall apart. Foam may seem like a cheap material, and the truth is foam surfboards are a lot less than hard surfboards, but they still are durable enough for multiple surf trips. As we’ve mentioned, foam surfboards are excellent for beginners to learn the sport because they are softer. When you’re learning how to dive through the waves or fall after catching a wave, a hit from a foam soft surfboard will be a lot less painful than a hard surfboard design. Foamie surfboards are also easy to use, which makes them a great first board for anyone wanting to try surfing. If you are entirely new to the world of surfing, it can be a challenge deciding which board would best suit your needs. Our guide will give you all the information you need to select a board, so that you don’t feel lost at sea and can focus on learning the basic rules of surfing. There are certain features to take into consideration that can determine which board is best for your needs and tell you if you’ve found a quality investment. You can also check foam surfboard reviews to see how a board has served for other surfers. In general, the length of your board will correlate to your skill level. Long boards are meant for beginners because they are more stable. Their long length will allow the new rider to easily catch waves and learn how to balance the board. Long boards can be hard to maneuver because of their larger size, but they will have you up on your feet faster if you are a beginner. Short boards are usually used by experienced or pro surfers. These boards will be drastically shorter than a long board and will be easier to maneuver. 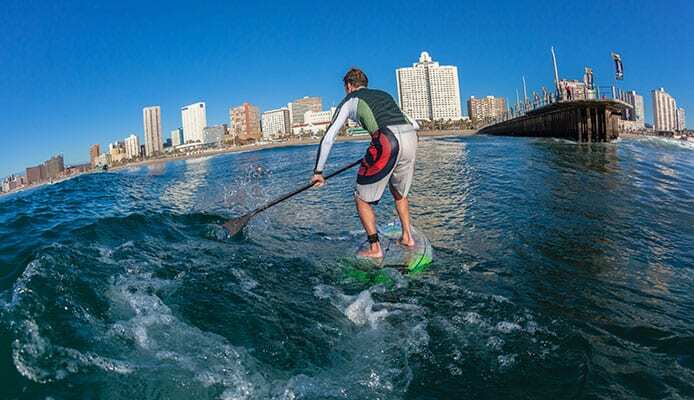 Short boards can be used for quick turns and flips, because of their smaller size. However, because of their smaller size they will also be harder for beginners to learn the balance of the board in the water. Their quick response to movement can be frustrating for those who are just trying to get on their feet. There will be a large variety of boards available with sizes ranging from 5 feet to 10 feet. If you are a beginner, we highly suggest that you use a long foamie surfboard. This will give you the stability you need to learn how to balance and get up on your feet. You may also want to check the width of the board. Generally, longer boards are wider, but there are wide boards that are short too. The width of the board can also give you stability to make it easier for beginners. It is important that you match the length of the board to your skill level of surfing. Expert surfers can easily use any length of surfboards, but beginners can’t. A foam surfboard for beginners will be longer in length and would be best, until the surfer has learned how to balance and maneuver the board. Once they have learned to surf, a beginner can move down in board lengths and learn how to surf faster. There are lots of different types of foam surf board designs. Different types may come in both long and short designs but will differ in the overall design of the body. Some popular types of surfboards include the fish, egg, hybrid, and gun. Fish surfboards: A foam surfboard for beginners likely won’t be this type, but it is popular for intermediate and expert surfers. The tail of this surfboard will be split in two. Egg surfboards: A foam surfboard for beginners may be an egg-shaped board. This means that both the nose and tail of the board are rounded like an egg. Hybrid: Hybrid surfboards may be great for intermediate surfers and may have foam surf board designs. These surfboards may have a fish tail but are still large and wide like an egg-shaped board. Gun: A gun shaped surfboard will have a pointed nose and tail. These may be less common in foamie surfboard designs but can be used by intermediate and expert surfers. In general, the type of surfboard can also appeal to the level of the surfer. Beginner surfers should look for a foam soft surfboard design that has a rounded nose and tail. The rounded design will make it easier for them to learn, as well as safer. If the board should hit you, a blunt end can leave a bruise, but it won’t leave a cut like a pointed nose or tail design could. 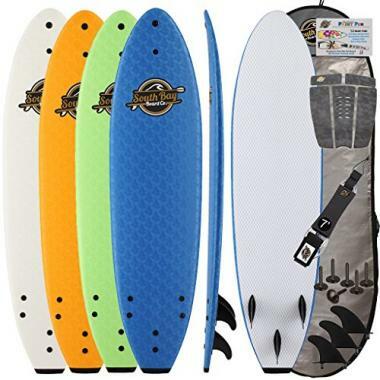 As well, surfboard foamie designs that have a pointed nose and tail will cut through the water easier and faster. For beginners, this can make it hard to learn how to control the board because it will be very sensitive to any shift in motion. However, there are also three specific types of foam surfboards that are based on the materials used. Polyurethane, Polystyrene, and Expanded Polystyrene are all used for surfboard foamie designs. Polyurethane is the most popular choice. It is lightweight and will allow the rider to have a sense of control over the board. The downside is that manufacturing polyurethane isn’t as safe, so this board isn’t as widely, or mass produced. Polystyrene is a common material used, but it has a longer manufacturing process, which makes it more expensive. Polystyrene in itself is not as strong, but many of these boards are covered in an epoxy resin, which gives them remarkable durability. Expanded polystyrene is the most popular choice of foam surf board designs. It is lightweight, moreso than Polyurethane and Polystyrene, which makes it the ideal surfboard. You will want to ensure you have the best foam surfboard type that suits your experience level of surfing. Choosing a board with a type that is best for another skill level will leave your frustrated with your surfing adventure. When choosing the type of material used, consider how long you want to use your board for and where. The most durable material would best suit your needs for a long-lasting foam soft surfboard. Most foam soft surfboards will have the same design. There will be a core that is made of foam or sometimes, rarely, wood. This core is shaped to ensure that it can support weight, but still be buoyant in the waves. They will be heavy surfboard because of their design. Over the core, the top and rails of the surfboard will be covered in a foam soft surfboard material. This material will ensure that you board has traction, padding, and floats easily on the water. A top rated soft top surfboard will ensure that it is rigid enough to still glide through the waves and support the rider. With the foam covering, you won’t have to worry about applying as much wax as a hard surfboard design. There may be a grip or traction pad added on top of the foam, but the foam itself should offer traction. Next, all foamie surfboard designs will use fins and a leash. The fins will be larger for a long board, than for a short board. For beginners, its best to use a longer leash for safety. Should the board get picked up by the waves, you can push it a safe distance away from you by using a longer leash. The best soft top surfboard will be extremely durable. Foam has come a long way and current foam surf board designs are heavy-duty, reliable, and strong. The core of these surfboard will be rigid and stable, but the foam outside will cushion against any falls and hits. A top rated soft top surfboard will use a high-quality foam covering for the board and rails, which will also ensure it is durable. The foam shouldn’t be easily damaged or punctured to ensure you can use your foamie surfboard again and again. Look for a foam surf board that has ding resistance and has performance durability. To find a durable foam soft surfboard, you may want to refer to foam surfboard reviews. Foam surfboard reviews can help you determine how well a foamie surfboard has resisted and lasted through multiple surf trips, in the words of other surfers. The best foam surfboard should have multiple reviews that give the design high praises. Overall, durability is extremely important for a foam soft surfboard. You want to ensure your surfboard won’t snap in hand on the first trip. A foam board should allow you to learn the basics of the sport but last you throughout the years as to gain more experience surfing. When we talk about the volume of foam soft surfboard designs, it means the amount of space that a surfboard takes up. You can estimate the volume of a surfboard by multiplying together the length, width, and thickness. Length x width x thickness will tell you the volume of the board. In general, the larger the waves you want to surf, the smaller you want your surfboard volume to be. If you are using a foam surfboard for beginners, you will likely be riding in smaller and flatter waves. Beginner surfers should use a foam surfboard with more volume. If you need to know the volume exactly, check out any product specifications before making a purchase. The volume of the board should be indicated by the brand. Or you can always estimate the volume yourself by using the formula listed above. Q: What is a foam surfboard? A: A foam surfboard is a type of surfboard that is massively popular. Most surfers will have owned or used a surfboard at one point in their life. Almost every single surfer will have learned how to surf using a foamie surfboard. A foam surfboard will have a foam core, which makes it more buoyant than hard surfboards. They are easier to control and stand up on, which makes them an excellent choice for beginner and intermediate surfers. A foam soft surfboard also has a deck, which is covered by a layer of foam. The foam covering will ensure less injuries when you fall off the board or are learning to dive beneath the waves. Rather than have a hard board impact your body, a foam soft surfboard will provide some cushioning. However, many expert surfers will still use a foamie surfboard. If the waves are smaller and they still want to catch them, a foam soft surfboard can ensure they are surfing every day of the year. A foam surf board could potentially catch more waves. A top rated soft top surfboard will be long-lasting and even if you are a beginner looking to upgrade your skills, it can still be used throughout a variety of surf adventures. Q: Are foam surfboard safe? A: Yes. Most surfers would even argue that foam soft surfboards are the safest of all surfboard designs and this is why they are often used to teach beginners how to surf. Foamie surfboards are excellent and safe for beginners due to their design and may help you survive a surfing wipeout. Specifically, a beginner surfer would want to a foam long board design. But it may be helpful to check a surfing safety guide too. Q: How to care for a foam surfboard? A: As with any of your surfing equipment, like caring for your wetsuit, you foam surf board will do best with proper maintenance and care. The more you care and maintain you foam surf board, the longer it will last while consistently giving its best performance. There are guides on how to care for your surfboard that can help you get started, but they may not cover the specifics of a foam surf board. In general, you will want to ensure that your surfboard is always rinsed with fresh water after every use. Salt is an abrasive material and it can leave a visible residue on a surfboard as it dries. A quick rinse will rid any salt and ensure your foam soft surfboard stays clean. You should also remember to store your surfboard completely dry and in a protected area. You may want to invest in some additional accessories like surfboard racks for cars and a surfboard travel bag to ensure it is always protected, even when traveling. 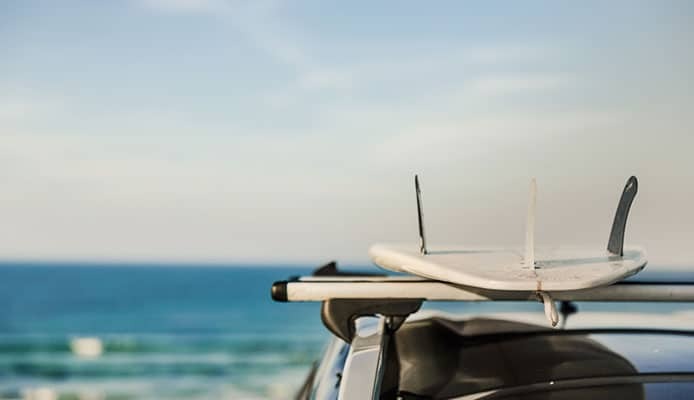 A travel bag can ensure your surfboard is not dinged or scratched and using a car rack can ensure your safety while driving, as well as ensure no damage comes to your surfboard. You will also want to apply the best surf wax and learn how to wax a surfboard, even on a foam soft surfboard. You will likely be using surfboard traction pads, but the rest of the board still needs wax for your body and feet. A great wax will ensure that you don’t slip off your board. Just be sure to keep your board in the shade. Q: What is the difference between a regular and a foam surfboard? A: The main difference between a regular and a foam surfboard is the material used in the body of the board. A regular surfboard will likely have a foam core but be covered in a hard and durable fiberglass and epoxy resin mixture. These boards are the traditional boards that are easily recognizable and called hard surfboards. A foam surf board will have a foam, or rarely, a wood core. The outside will then be soft and covered in foam too. Both a regular and a foam surfboard can come in a variety of types, styles, and lengths. You should be able to find a board that you love to use and suits your needs. However, the best surfboard for beginners will likely be a foamie surfboard. Once you have experience with surfing, you can easily move onto a regular surfboard. Surfing is a fun water sport activity that anyone of any skill level and age can try. It’s easy to prepare for a surf trip when you have all the information you need. A top rated soft top surfboard can have any surfer easily catching waves. If you are just getting started, you can feel secure with the best foam surfboard. Even if you’re experienced, a relaxed day with a surfboard foamie can be fun. It is important that you find a surfboard that suit your level of skill and abilities. You don’t want to be left frustrated or injured because you choose a board too difficult for you. If you know exactly what you need, you can save time and money by investing in the best soft top surfboard. Do you own one of the foam surfboards that made it onto our list? 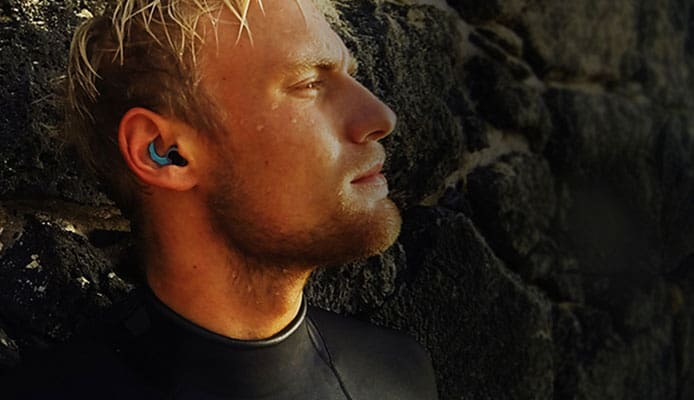 Let us know how it has worked for your surfing needs in the comments section below.